Green Bank Telescope will team with the Parkes Telescope in Australia in a $100 million, privately funded search for radio signatures that would indicate the presence of advanced civilizations on other worlds in outer space. 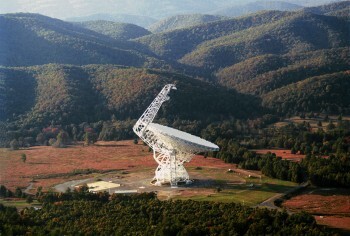 CHARLESTON, W.Va. — The National Radio Astronomy Observatory in Green Bank — the place where the world’s first scientific search for extraterrestrial intelligence began in 1960 — will play a key role in the most powerful, comprehensive and intensive search ever undertaken for intelligent life in the universe starting in January. The observatory’s 100-meter Green Bank Telescope, the world’s largest fully steerable radiotelescope, will team with the 64-meter Parkes Telescope in Australia in a 10-year, $100 million, privately funded search that will scan the nearest million stars in our own galaxy as well as stars in 100 other galaxies for radio signatures that would indicate the presence of an advanced civilization. The project, called the Breakthrough Listen, is funded by the Breakthrough Prize Foundation and will channel $2 million a year for the next 10 years to the Green Bank Telescope under the terms of a recently signed contract. “We are delighted to play such a vital role in hopefully answering one of the most compelling questions in all of science and philosophy: Are we alone in the Universe?” said Tony Beasley, director of the Charlottesville, Virginia-based National Radio Astronomy Observatory, which operates the GBT and other National Science Foundation-funded radio astronomy observatories.